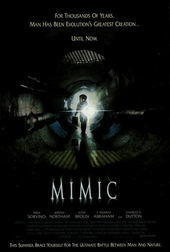 Author Andrea Codrington discusses the opening titles for Mimic, from her 2003 book Kyle Cooper: Monographics. Similar in detail and obsessiveness to Se7en is Cooper's direction for the main titles to Mimic. Rather than scraping around on his own ﬂoors for dead bugs, however, Cooper travelled to insect-collecting shows to ﬁnd the perfect specimens to embody the eerie atmosphere of an entomologist's laboratory gone horribly wrong. 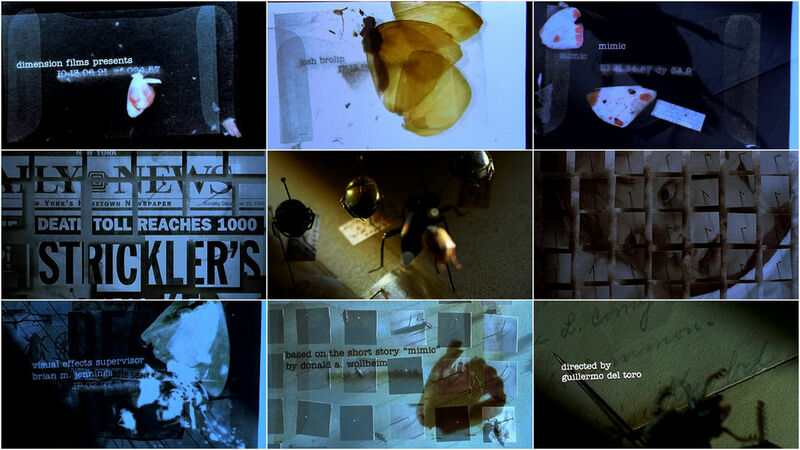 Insects dappled with intricate patterns are pinned on specimen cards; glassine envelopes hold the remains of torn butterﬂy wings; beetles come to life and lower-case credits replicate endlessly across the screen, giving a visceral sense of the ﬁlm's story about a plague that has created human- sized moths. Cooper's favourite leitmotif, the eye, is played up in Man Ray-reminiscent tableaux comprising black- and-white eyes cut from photographs that are pinned and surrealistically wriggle under the harsh light of the researcher's lamp.